Reports suggest that the new 2018 Discover 110 will launch on January 10. Bajaj Auto Ltd is one of India’s largest two-wheeler manufacturer and its foray into the bikes segment has left the competition gasping for air. Bajaj has been constantly improving their product lineup and refreshed models keep us busy posting about them every month. With a wide portfolio and a great lineup, Bajaj is all set to put the Indian auto market on fire. With the 2018 Auto Expo approaching, all manufacturers are ready with their larget guns to showcase. Bajaj Auto refrains from participating in the Auto Expo claiming that is it simply not profitable enough. The company did so in 2016 and will repeat the same this year. Bajaj Auto will arrange a press conference right before the 2018 Auto Expo to unveil their latest offerings. Bajaj’s S Ravikumar recently revealed that the company plans to launch two new products this month. Stay tuned to find out more about the upcoming 2018 Bajaj Discover 110. 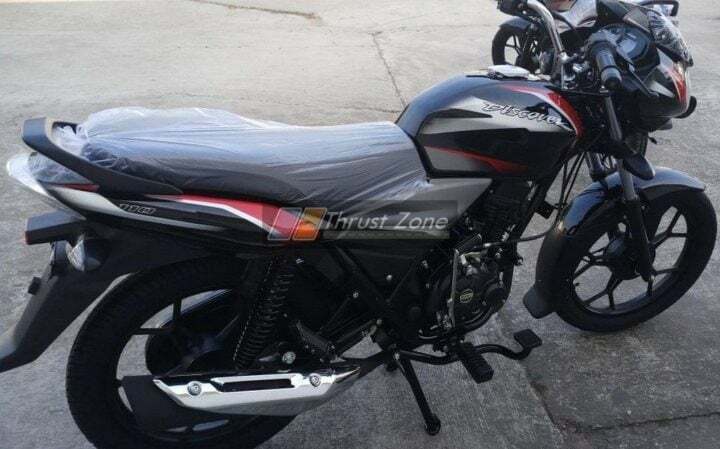 As per reports on the web, Bajaj is planning to launch the 2018 Discover 110 on the 10th of January 2018. With the Platina ComforTec and the CT100 both being 100cc bikes motorcycles, the launch of Discover 110 will mark the company re-entry into the segment. The current Discover 125 costs INR 53,171 and you can expect the upcoming Discover 110 to undercut it by a slight margin. The final price of the 2018 Bajaj Discover 110 will be available post-launch. The upcoming 2018 Bajaj Discover 110 is more of a mid-life facelift. The new Discover 110 will feature new decals and graphics on the body. The headlamp cowl features red and silver graphics. There are refreshed decals on the tank accentuating the body lines. The rear quarter features a similar design philosophy with a 110 badge. The upcoming 2018 Bajaj Discover 110 will derive its power from a 110cc DTS-i unit with either two or four valves. The engine will produce 9PS of power and 9Nm of torque. It will come mated to a four-speed gearbox. Securing the engine in its place is a semi-double-cradle. The Discover 110 will feature both options for ignition i.e. kick-start as well as electric. The 2018 Bajaj Discover 110 will employ telescopic suspension at the front and gas-charged dual shock absorbers at the rear. Stopping power comes from drum units at each end. The drum brakes share the same size at each end of 130mm. The fuel tank will hold a capacity of up to 8-litres of fuel. The Bajaj Discover 110 will sport 17-inch tyres at both ends with the front and rear tyre size being 1.4×17 and 2.15×17 respectively. In terms of features, the upcoming 2018 Bajaj Discover 110 will feature an updated instrument cluster with an analogue-digital combo unit. Apart from this, everything remains as is. The upcoming 2018 Bajaj Discover 110 will be a really frugal engine with the company’s main focus on better efficiency. The Bajaj Discover 110 is expected to deliver 80kmpl in the city and 90kmpl out on the highway. The combined cycle of 70% city usage and 30% highway running will amount to a total average fuel consumption of approximately 88kmpl. Stay tuned for more info on upcoming motorcycles in India.